Malcolm Clark is a past president of TUG. Dave Walden, interviewer: I am pleased that Malcolm Clark has agreed to tell us a bit about his life and his involvement with TeX. Malcolm Clark, interviewee: I had the pleasure and good fortune to be TUG President briefly, in 1993. I feel that I've had the great good fortune to often be at the right place at the right time. Born in 1947 I'm a baby boomer (with all those inherent advantages), and born in Scotland it was pretty well guaranteed I'd go to University. I went to one of the post-Robbins universities (another advantage of timing and location) where I did a BA in Geography graduating in 1970. Another advantage since the discipline trains you to seek out connections. To be honest I didn't really seek out Geography, it sort of captured me (I blame plate tectonics: there was no going back). Glasgow's Strathclyde University also provided a few other key elements. I'd meddled in poetry before I got there, but I became friends with people who were into Concrete Poetry, and in particular with a guy who knew Ian Hamilton Findlay (look up 'Little Sparta'). Concrete Poetry was blossoming a little. The University had some sort of Arts Festival and with a few colleagues we mounted a little display of CP (appropriately, in the Architecture Faculty). One of the tenets of CP is that the form and presentation of words can enhance (or even provide) meaning. I also had the great good fortune to meet Edwin Morgan whose poetry (conventional and concrete) was an inspiration. Eddie eventually became known as Glasgow's Poet Laureate, a richly deserved title. At the time (late 60s) we were all struggling with typewriters and the nearest we got to typography was Letraset (a commercial dry lettering technique). I continued to write some pretty dire poems (if you look hard enough you might even find the two which were published: reading them again they aren't quite as bad as I remember). From Strathclyde I went on to do a Masters in Physical Geography at King's College London. It was about this time I was introduced to computers. My (now) ex-wife had 'learned' Algol as part of her Maths degree, but as part of her Masters she learned Fortran. So I did too. I won't bore you about punched cards and all the other indignities of using computers 40 years ago. Mostly as a result of being at King's, knowing a bit of Fortran, and being a Geographer, I ended up in 1973 at London School of Economics as a Research Assistant to Dr John Thornes. One of John's toys was a mini-computer which had an alphabetic keyboard (not a qwerty, but an abcdef: John never learned to use a 'conventional' keyboard. I still think this an easier entry level, and why we cling on to the layout of the keyboard that is a result of manual typists typing too fast and locking up the keys defeats me. A manifestation of the stranglehold that the dead hand of technology can have.). Of course by mini-computer I mean something which was about the size of a large refrigerator. My interests within Geography were mostly at the mathematical or statistical end (so-called Quantitative Geography was a huge growth area at the time), and inevitably I was trying to type up material with mathematical content. My then wife was (still is) a mathematician and her research interests reinforced this common goal. We bought an IBM golf-ball typewriter with a couple of heads to do symbols. It was hard work, but already the satisfaction of getting something reasonable was beginning to appear. When the funding ran out the School's Computer Unit took me on as an Analyst/Programmer. At the time London University had a 'collegiate' structure where the constituent colleges were at least nominally co-operative. One aspect of this was University of London Computer Centre, where some reasonably powerful kit was available to all of the colleges. What this meant was that the computing skills I used at King's were transferable to LSE, Imperial and some of the other colleges. In 1978 I moved to the Computer Centre at Imperial College as an Analyst/Programmer. I think that meant I could write Fortran and interpret SPSS errors (it's those transferable skills). Imperial was a pioneer in interactive computing. Looking back, the combination of Control Data Corporation's super-fast (in those days) processors with a network operating system was remarkable. They also developed a home-grown mainframe based wordprocessor, which took advantage of dot matrix printers to do fancy things like italics and bold (this was cutting edge stuff!). This wordprocessor was tweaked further and further until it could start to do mathematical expressions. Imperial also bought an Autologic APS micro-5 phototypesetter, and Joan Bryan (who later became the wife of my roommate, Ian Chivers) interfaced the wordprocessor to the typesetter. Now we had access to a range of typefaces, and some quality output. Ian and I were teaching the College's Fortran course. We wrote a text for use on the course and used the typesetter to produce the galleys. It was published in 1984 as 'Interactive Fortran 77'. It was still hard work to generate mathematical expressions. I'm not quite clear how it happened, but we acquired a CDC implementation of a version of TeX (memory describes it as TeX 80), which was interfaced to the typesetter. I learned TeX, and started to wrestle with how to get it to produce something useful on this combination of CDC and typesetter. Of course there was no preview so the first sight we had was what would now be regarded as final output. Naturally there was lots of wastage. Laser printers were starting to appear, but they were hugely expensive and PostScript was still in its early stages, and by no means a de facto standard. One of the first users of TeX on the typesetter was Kaveh Bazargan. I'm sometimes amazed that he stuck with it, and enormously grateful that he did. To me, Kaveh is one of the group of people who will ensure that the TeX engine survives well into the future. Sometime about then I started to teach a TeX course at Imperial. Ironically the first set of notes were produced on the wordprocessor system since the CDC TeX implementation wasn't robust enough for the job. Having said that it was robust enough for me to produce a book in the IUPAC series an behalf of people in the Chemistry Department. That TeX course eventually became 'A Plain TeX Primer' in 1992. And then we were equipped with a 'microprocessor' lab. Somehow we also managed to acquire microTeX (the pc implementation marketed by Addison-Wesley) and things started to get a bit easier. On the other hand it wasn't interfaced to the typesetter. Sadly that typesetter never did talk PostScript. The pc implementation did make teaching TeX much easier. Again, I can't quite recall the timing, but the next important change was coming. Sometime about 1986 or 7 I bought my first Apple Macintosh. Again, looking back, it was a rather limited little beast, with only 1 megabyte of memory, a megapixel screen and no hard disk. But what it did have was Kellerman and Smith's TeXtures: an implementation of TeX which ran from floppy disk. Soon after I upgraded it to an internal 10 megabyte hard disk, and I really didn't think it could get any better. TeXtures was a revelation; it worked, and the preview was so good. I could produce dvi at home and print it out at Imperial (I could afford a Mac, but a laser printer was beyond my hopes). I've still got that Mac (it's in the loft somewhere; it's so iconic I can't bear to junk it). It's hard to put the TUG contacts into this chronology. I remember picking up a tape from Barbara Beeton at AMS in Rhode Island for use at Imperial. I guess that was my 'first contact'. I think this means I was identified as a friendly. I also recall attending a TUG conference, which must have been at Stanford and may even have been about the same time (or part of the same trip). Somehow, I was invited onto the TUG board as some sort of UK or even European 'representative'. Barbara can probably help with the chronology and nomenclature. The next big thing was TeX'88. With Cathy Booth (who I taught on my very first TeX course at Imperial) I organised a TeX conference at the University of Exeter. It was well attended by colleagues from the US and from Europe, as well as accumulating lots of the local UK enthusiasts. It seemed to work and I think that most people who attended departed with happy memories. I published a newsletter, TeXline, from 1984 to 1992, which Imperial unwittingly funded, and which may have helped disseminate TeX and TUG information. (A small prize to anyone outside the UK, or who is under 45, who identifies the source of the name 'TeXline'.) Within the UK we organised a local group, and I was fortunate to become its founding chairman in 1994 narrowly beating the very worthy Peter Abbott to the post. 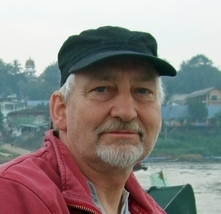 Peter had created the UK TeX Archive at Aston University, the original online resource. Peter's achievement in establishing the archive eclipses anything I have ever done in the TeX world. I was doing a bit of TeX teaching on behalf of TUG usually as part of a TUG conference (it helped cover my expenses), but of course helped me travel to Boston, College Station (!) and Stanford, among others. It was on a course at Boston that I met Kath Butterfield, who was later to convince me that I had to change the act and start teaching LaTeX, which I eventually did at Berkeley. She was right. TeX is for techies, LaTeX is for the rest of us. I was a late convert. And in between I was able to trip around teaching and attending lots of conferences. I can't imagine how else I would have found myself in Lvov or Johor Baru. Being in a specific place at a specific time pretty well accounts for how I ended up as a TUG President in 1993. The details evade me. I remember it being a time of pretty intense politicking and that some awkward stuff was going down. I think I was some sort of compromise candidate, who had the advantage of serving only one year rather than the usual two. I certainly hadn't gone to the meeting with any expectations other than 'business mostly as usual' although if I'm honest with myself I had hoped that in the fullness of time I might aspire to the role. After I left Imperial, for a brief stint at the Imperial Cancer Research Fund in 1990, and then to the Polytechnic of Central London (which transformed itself into the University of Westminster) I managed to keep up my TeX/TUG involvement, and even when I moved to the University of Warwick in late 1993. However, in 1996 I eventually returned to King's College, and found that there was no call for my TeX skills, and by that time my role in TUG was pretty well over, despite (or maybe because of) a rather fraught guest editorship of an edition of TUGboat in 1995. And I had far too much to do in my day to day job. I also discovered sailing and my surplus energies disappeared into keeping the dinghy upright. I took early retirement from King's in 2002. At which point I was invited to teach King's PGs LaTeX. I did find this rather deliciously ironic. The course notes (still a work in progress) are somewhere on my website. In addition for many years I had been active in the British Computer Society's Electronic Publishing Specialist Group. We used to organise regular meetings under the umbrella of electronic publishing. I was briefly chair of the group (although as I recall David Penfold seemed to do most of the work). Yes, I do still use TeX/LaTeX. I'm writing stuff on yacht and dinghy scoring systems, which enables me to combine two favourite past-times. All along I've been a theatre goer. I find live performances enthralling. Even poor ones. Living in London provided lots of opportunity, and even the Midlands is well served with live theatre. For reasons that I don't quite understand, I'll travel miles for a performance of almost any Greek play (especially if it is in Greek, not one word of which I understand! Surtitles are getting better.). I remember a full day at the Edinburgh Festival with three Greek plays in Russian. Now that was epic. I also have a long term interest in sculpture, particularly direct carving. That may just have been TeX related, though perhaps a bit tenuously. Through our activities in ukTUG I had the pleasure of meeting David Kindersley. David developed a system for 'optical character spacing', which probably surpasses TeX's spacing, and had been apprenticed to Eric Gill (who you may know better for his typefaces, rather than his sculpture). I did say it was a tenuous link! Behind every contented and downright happy man there is a family. I live with my partner Sue. We are in the process of moving home from Coventry, as far from the sea as you can get in England, to Penryn (west Cornwall), not far from the Carrick Roads, some of the finest sailing in Britain. My son Audun lives in London with his wife and daughter Eleanor (our granddaughter! ), while Sue's son Colin is also based in London. I'm not sure which of Colin and myself were more surprised when he was at Cambridge University and my LaTeX skills suddenly became valuable again. He produced most of his course work in LaTeX, and was expected to pick it up on the job. Some of the subtleties of LaTeX are not particularly intuitive. And it's easier to be introduced to some of the tools than to stumble over them. Having said that, I still think Leslie Lamport's book is a study in concision. You just have to read it. I've mentioned a few people. I debated whether to mention everyone who I though was significant, but rejected that idea on the grounds that it would mention pretty well everyone in the TeX world, and perhaps offend a couple of people I inadvertently overlooked. But Dougie, Chris, Sebastian, Bernard, Joachim, Pat, Ray, Christina, Lance, Barry, Suki, Paul, Richard, Robin and a hundred and one other TeX friends, you are not forgotten. I think that's one of the things I liked, there are a lot of friends out there. The one person I haven't mentioned is of course our founder, Don Knuth, without whom I would have filled my life rather differently. However, the cover of my Plain TeX Primer is an oblique homage to Don. I leave the proof to the reader.